There have been so many times as a parent that I wonder if I am related to my children. Like when one of my children goes a week without changing his underwear and socks or hides almost a hundred empty candy wrappers in his pillow case. I mean, seriously, how can you sleep with all that crinkling every time you move? Or when my daughter gets upset at me and waves her finger in my face and says defiantly “No, Ma’am! You stop that!” It takes all I have not to laugh out loud when she parrots my motherly chastisement back in my face. Many of my children’s behaviors are foreign to me at this point in life. I never remember struggling with the same things as they do. But of course, I had struggles of my own. Some days, it takes all of my patience to remain in control. I try to remember that I was once a child and thankfully, someone had patience with me. Also, looking back at their baby pictures brings back all those endearing motherly emotions which help to round out my perspective, helping me to see the whole picture. So, even though there are days that I wonder where they came from or whom they belong to, I am so thankful that they are mine. And that I get to help them through all these changes and stages in life. Because when it comes down to it, nothing lasts forever. 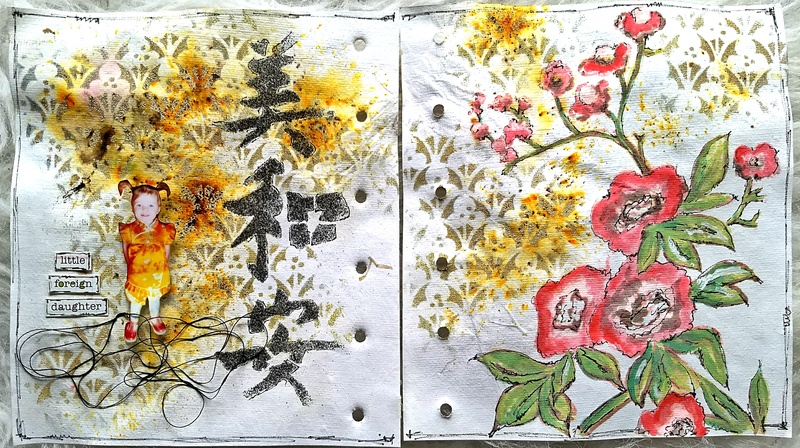 I started off using my new StencilGirl Chinese Garden Plum Blossoms stencil. 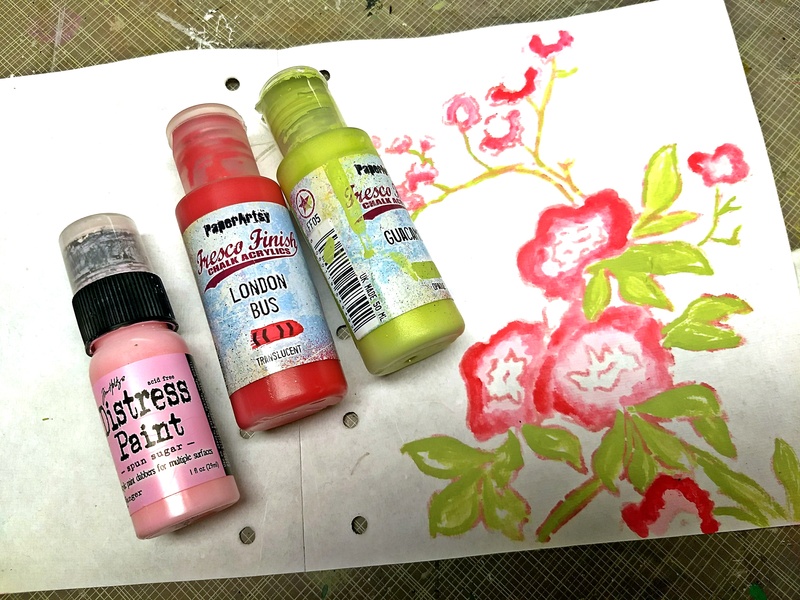 I stenciled with red ink and started painting using some Distress Paint. I finished off by adding some doodles around the flowers. 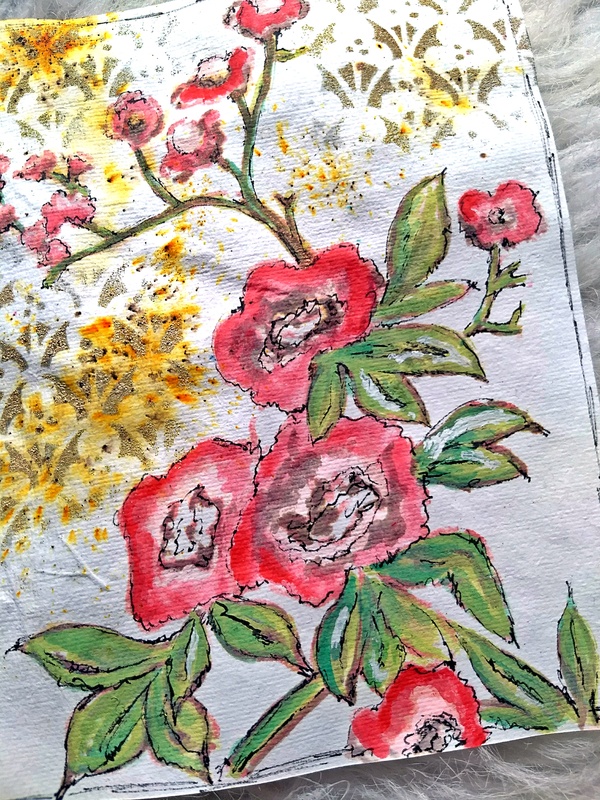 I stenciled using the Ornamental Floral Screen and used PaperArtsy Infusions. Happy Tea Day to all those playing along with Elizabeth and Bleubeard. I am a bit late today but better late than never. 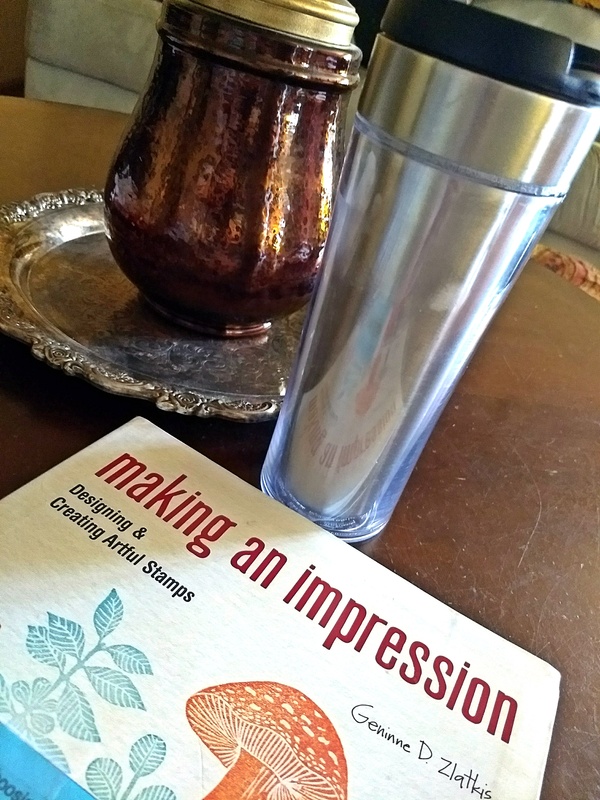 I am sharing my fresh mug of green tea as well as a book that I recently read on carving your own stamps. I will share my stamp carving venture in another post soon. Times have changed, life as we know it has changed. I remember when we had no computers, no cell phones (I STILL don’t own one), and no downloadable music. I don’t remember black and white TVs, but Sally does, and remarked how married people on TV slept in separate beds. I know we have gotten far more sensual in what we see on TV, and I LOVE that we now accept gays, lesbians, and mixed marriages. So your struggles and your children’s struggles may not be the same, but they stem from the same things: insecurity, impatience, poor teachers, and others who influence their lives on a daily basis. 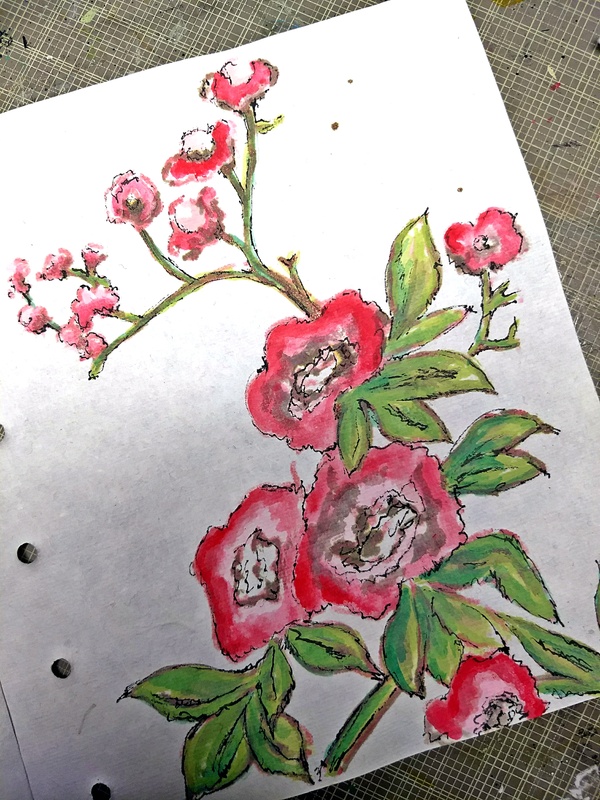 This is a lovely entry in your daughter’s art journal, and I was thrilled to see you chose to share it with us at Art Journal Journey, too. I was delighted you shared your tea with us for T this Tuesday, and I know I’m going to be impressed with your stamp carving skills, too. BTW, I had to laugh at your comment about retirement. Tell me that in about 20 years, please!!! This is gorgeous! I love the way you used the stencils here… and seriously, wrappers in the pillow case? that would drive me nuts! lol. I read Elzabeth’s wise words above and I whole heartedly agree. Your little girl looks such a sweety and a real character in that lovely photo and your stencilled and painted page is just wonderful! You will remember these times with your children and perhaps remind them of the things that happened when they are grown and have children of their own. It was a lovely post to read. Your journal pages are gorgeous it is a lovely flower stencil you used. If you would like to share your fantastic pages with us at try it on Tuesdays as well, we would love to see you there. What beautiful pages! Having had children myself, I can understand what you are writing about. I hope you have written on the back of the page to explain the word ‘foreign’. In twenty years time your daughter will smile at those things and probably won’t remember them. I am in love with those amazing pages, GORGEOUS and you made me happy to join in at Art Journal Journey with them. Thank you very much dear Kate! it is incredible what you created started with that stencil and going on from there – painting with Talent! wishing you a wonderful week and happy (belated) t-day! Another lovely muse, Kate. And another lovely page for your daughter’s journal. She’s a cutie! Beautiful layering of just the right things! Your thoughts are classic, all mothers know them! What a gorgeous page spread – it has colour and movement, but also such a sense of light because of the white space. I’m sure your “foreigners” will start making sense again soon! Two very beautiful pages.. lovely colours and details.